The DIY Bride: Monogram Table Runner - Check! I decided to add some artificial daisies to the monogram to give it some more dimension, and I added those with hot glue. 1. Start with a large flat surface and tape your enlarged monogram down onto the surface. 2. Lay your table runner over the enlarged monogram, and with a pencil, trace the monogram onto your runner. Don't press the pencil into the runner too hard, but enough so you can see where to paint. You don't want pencil lines to show on your final product. 3. 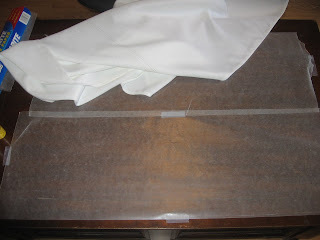 Fold back your runner, and tape wax paper over your flat surface. You'll want to do this because the paint will leak through the runner and attach to the surface. Wax paper will prevent this from happening and will easily release the dried on paint. 4. Place your runner back over the wax paper area, and begin painting. I STRONGLY urge that you use fabric paint because it won't bleed, and the end result will look a lot better.Also, depending on your monogram, depends on how long it will take you to paint the entire runner. I had four colors in mine, and had to take breaks in between the colors to let them dry. Also mine involves many small details, so that also made the process longer. Overall, I very happy with it. I can't wait to display it over our gift table at the reception. I also plan to keep it and turn it into a piece of wall art after the wedding is over! I saw another similar tutorial on another site and think this is so great. You did a great job!